Luck and good fortune are two things we wish for all the people we care about. 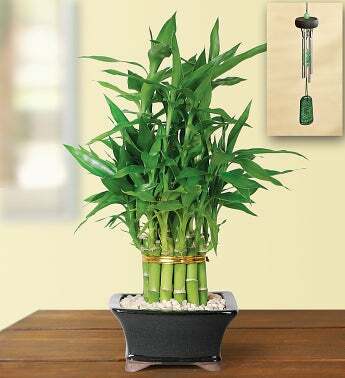 Our pyramid of bamboo greenery is a powerful symbol of both. And because indoor plants are known for fostering good health by cleaning impurities from the air and enhancing mood, these lush, leafy stalks will bring a sense of balance and harmony while creating a calming natural indoor landscape. As a complement to this special gift, add our mini wind chime set, which provides peace and tranquility.